He also said, however, that he has a number of qualms with the “seriously flawed” bill. Most notably, with the fact that it restricts his ability to ease sanctions without Congress’ involvement. To waive sanctions, Trump has to send Congress a report explaining and justifying his decision, and lawmakers would then get 30 days to decide whether to allow the waiver. Putin retaliated pre-emptively by booting 755 U.S. embassy and consulate employees, and with huge majorities approving the sanctions in Congress (98-2 in the Senate, 419-3 in the House), Trump was left with little choice but to move forward. ??????????? 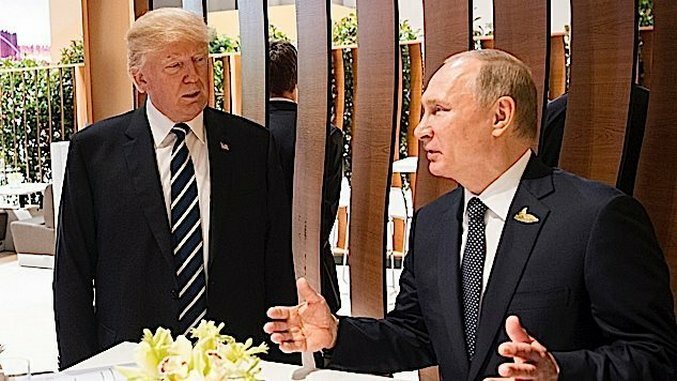 ?Top WH source: Trump spoke with Putin before he signed Russia sanctions bill. No word yet on what #PutinsPuppet told him, but stay tuned! The White House has denied Trump spoke to Putin before signing the sanctions bill. So the countdown to discovering that's a lie begins now. Q: Before he signed the sanctions bill, did Trump have a convo with Putin?